Saw Prometheus. Was entertained, movie had some fun going on, but some strange flaws in acting and writing. Without spoiling the film, I can say I found the last 5 mins to be most flawed writing-wise. The abundant foreshadowing seemed blunt to me -- each time I thought "that'll be back". Also the 'my father' line was no surprise -- except in its almost humorous delivery. Acting wise, the most glaring things were the distance between faced which was always minimized to reveal tension -- but felt very artificial to me. I really liked the 'David' character and somewhat liked the super-old guy, but was unconvinced by the makeup that this was an actual old person. *spoiler* - have some beef with the 'engineers' portrayal, the 'vials' or weapons, and the way the humans explain everything by their out-loud conjecture, while David clearly has an inside track -- which is never explained. Why'd he infect the 2 doctors? And the scene-stealer --> What's with the amazing DIY abortion?!? What's with all the alien orifice - penetrating monsters?!? 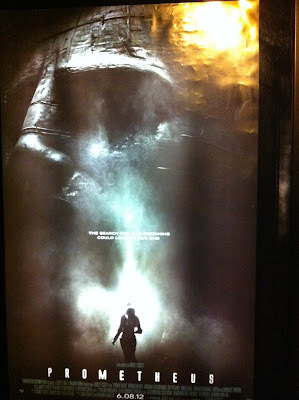 Prometheus summary: occasionally awesome, gave too much away at end with simple exposition, many characters' decisions seemed unlikely & unbelievable. 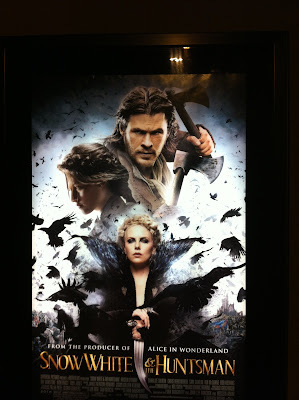 Then when I finished, I snuck into Snow White & the Huntsman. Aha! Now I realized the significant difference in film quality. Yeeesh!!! Let's see -- this movie sucked sucked sucked!!! heh -- I wasn't exactly surprised -- it's why I snuck in. No spoilers offered, no analysis except this: formulaic fantasy-drivel with too much CG and no significant character growth/depth. Did have a strange veneer of Goth/EMO drama, and the CG was ok. The lead actress has quite large nostrils, and the DP does a lot of 'up the nose' shots of her. USA fighting Terorrism -- with Terrorism?!? !